The book contains all your traditional bakes – as well as plenty of new takes on old favourites – mince pie buns and meatball stuffed turkey, to name a few. A fab read as well as an incredible resource for anyone wanting to add some Scandi elements to their Christmas celebration. Recipes span from aquavit bloody Mary to rye & banana bread with cinnamon butter, green crispbread pizza and summer celebration cakes. Also included are sheer indulgent cinnamon bun french toast and celebration cakes that burst with summery produce – plus new takes on old favourites such as Beef a La Lindstrom Burgers. Like her viking ancestors before her, Brontë Aurell left Denmark to explore the world beyond home shores and in her travels has come to understand the fascination with her kinfolk, as well as seeing the idiosyncrasies of the Scandinavian lifestyle that locals take for granted. Whether you want your apartment to look like it belongs in Copenhagen, to workout like a Norwegian or to make cinnamon buns like a Swede, this is the ultimate insider’s guide to the countries of the north. Full of inspiration and ideas, how-tos and recipes to help you experience the very best of Scandinavian design, philosophy, cookery and culture. With a signature wit and a keen eye for detail, travel alongside Brontë through fjords and mountains, farmlands and cities to better understand these three nations and what makes each one so unique. So get outdoors, learn the life lesson that there’s no such thing as bad weather (only bad clothing) and you may discover your inner Scandi sooner than you think. Fika and hygge are two Scandinavian words gaining more and more popularity – and we understand why. The Swedish concept of fika (fee-kah) means taking a little break from the daily grind to sit down, connect with someone and perhaps have a cup of coffee and something sweet. Hygge is a Norwegian word embraced by the Danes, and the concept of Hygge is usually associated with the latter – in Norway it is often called ‘kos’. Hygge, in essence, is a feeling of safety and contentness. 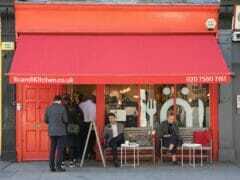 Candles, your favourite people, a cup of tea or coffee or a piece of homemade cake can all enhance the feeling. This book is a collection of recipes from across Scandinavia, all beautifully illustrated and divided into chapters – Biscuits and Cookes, Tray and No Bakes, Everyday Fika, Little Fancy Cakes, Celebration Cakes and Bread and Batters. Something for every baker, and every occasion. Our very own cookbook: The ScandiKitchen Cookbook. With more than 75 recipes this book covers all our favourite Scandi recipes – from breakfast to supper and everything in between. Learn how to make your own Swedish meatballs, soft and fluffy cinnamon buns, healthy and hearty salads, our Scandi Christmas favourites and tons more. When you first go to Copenhagen and you visit someone’s apartment, you usually end up in awe … ‘Are they interior designers?’ you ask yourself. ‘What style!’ you exclaim, tearing up your insides as you try to forget about your own bedsit hovel with magnolia coloured walls. Then you visit someone else, and you think ‘Oh, this place looks quite like Søren and Sofie’s’. Third time around, you know: there is a ‘style’. It’s a thing. 1. Rip up all carpets and sand your floors. Then paint them white. 2. Paint all your walls white. Yes, all of them, white. 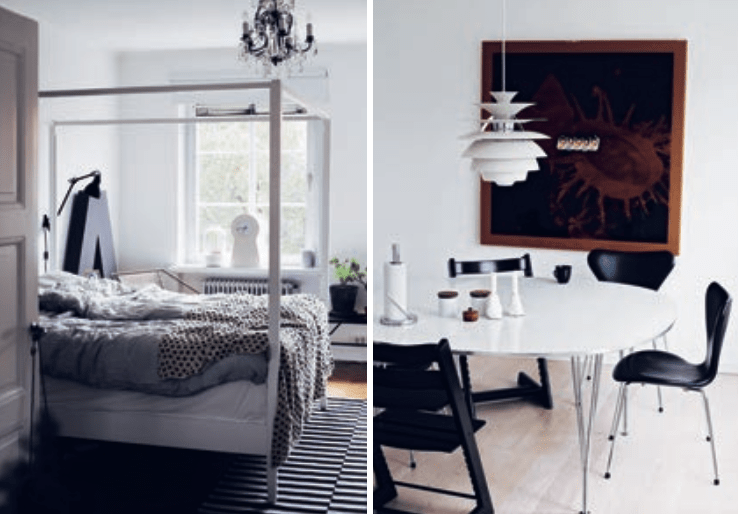 If there is a shade of white called ‘Scandinavian white’ or ‘Ringsted white’ or ‘Vesterbro white’, go for that, it’s probably whiter and better with even more white added, so go for that. 3. Paint all your skirting boards and doors white. 4. Remove all curtains and traces of curtains, because you no longer need them. If you can’t live without window coverings, add some (white or neutral) stylish blinds, but make sure that, when they are rolled up, you can’t see them. It must look like you have no curtains. Curtains are bad. 5. Get one colourful statement chair, ideally by a designer from Denmark. Anything with the word Jacobsen or Wegner is good. It will cost the same as a remote village, but it will be worth it because it’s just so beautiful and perfect. Buy a woolly sheepskin from a remote farm in Sweden and add this to said statement chair. 6. Have one normal chair next to your sofa where you add a stack of books or magazines with pictures of bearded men. Leave them there, in an ordered unordered fashion. 7. Put just one green plant in the window. 8. Your sofa must be a tasteful colour or stick to black. It must also be simple – none of this ‘all the way to the floor’ business. Legs – and nothing underneath. People must be able to see you have nothing stored under there and that your stylish white floors are also stylish and white under the sofa. Thou shalt not add too many cushions. 10. Hide your TV in a sleek hideaway “I never watch it anyway” place, or even better, don’t have one. This is an extract from Bronte’s book Nørth – How to live Scandinavian, now all in all good bookshops – and also available in our shop and online. Photo by Anna Jacobsen. There is literally nothing more Scandinavian than a good old Smörgåsbord. Except, Smörgåsbord is a Swedish word and in Norway and Denmark, it’s called something else (Koldt Bord (cold table), and similar). But really, it’s all about food and our way of grazing through a nice, big wonderful lunch. No matter which of the Scandinavian countries you are in, follow this guide and you won’t go far wrong, bar a few regional variations. As long as there is enough aquavit, people will be happy. The word smörgåsbord comes from the Swedish word smörgås, meaning ‘open sandwich’ or ‘buttered bread’, and bord, meaning ‘table’. If you translate it very literally, it could also mean Butter-Goose-Table, but that would be wrong, although quite funny. A smorgasbord is basically means a buffet made up of many smaller dishes: ‘a laid-out table’. The traditional smörgåsbord is slightly different, depending on the country you are in. Just follow the guidelines of what to eat and in what order and you’ll be all right, no matter where you are. It’s our tapas, our buffet, our small-plate-phenomena. The term smorgasbord first cropped up outside Scandinavia during the 1939 World’s Fair in New York, when a Swedish restaurant served a smörgåsbord as we know it today. This, however, was not the first occasion of a smörgåsbord, as this was more of an accidental invention. Many centuries earlier, people in well to-do homes had what was known as an “Aquavit Table”. They would return back from whatever they had been doing (hunting moose or looking after their estates etc) and enjoy a few snacks. A few hours prior to dinner, shots of aquavit were served, likely as an afternoon pick-me-up. These were accompanied by a selection of cheeses, pickles and meats laid out on a side-table to snack on before the main meal. Over the years, the choice of dishes expanded and, one day, the Aquavit Table because the main event instead of the actual lunch or dinner. Clever marketing people at the World Fair coined a new word that since then has been adopted into a word that works in many languages. The essence of a real smörgåsbord (or cold table) is all about taking your time to eat and talk to your guests as you do it – and share food, conversation and time. There is lots of food, granted, but we spend many hours eating it. No smörgåsbord ever took an hour – and there is no time limit on how long we might sit there – the Danish Christmas Table, for example, can easily take an entire afternoon and end with an early dinner and most certainly result in quite a hangover, too. This is why these are usually done during high seasons such as Christmas, Easter and Midsummer when people plan big get together and have time to relax and enjoy both food and company to the max. 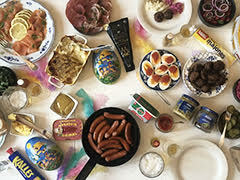 Traditionally, a smörgåsbord is served in ‘rounds’ – on a Swedish one, usually everything is set out at the start of the meal in buffet style, whereas in Denmark, each round is brought to the table one after the other in strict order and shared round. It’s tricky to know how to maneuver a smörgåsbord if you are a rookie, especially if you are in Denmark and nobody has told you that there are seven more rounds of food to follow the one you are eating. What foods go together? Can you put remoulade on liver pate (answer: No) and do you ever put herring with prawns (answer: NEVER). How much aquavit are you allowed to drink? (Answer: As much as you can, but not so much so that you appear drunk until everyone else is). Rookies will fill a plate like they are at an all-you-can-eat buffet. They will also hit the aquavit hard – and you just know that no rookie will last till the end. Many a newbies have fallen off the Smörgåsbord wagon at round 2 and missed the party. The biggest smörgåsbord of the year is at Christmas. This is the julbord (literally meaning ‘Christmas table’) and is also the one that takes the longest to complete. There are many dishes and rounds – and there will absolutely be beer and aquavit, too. And singing. Lots of singing. 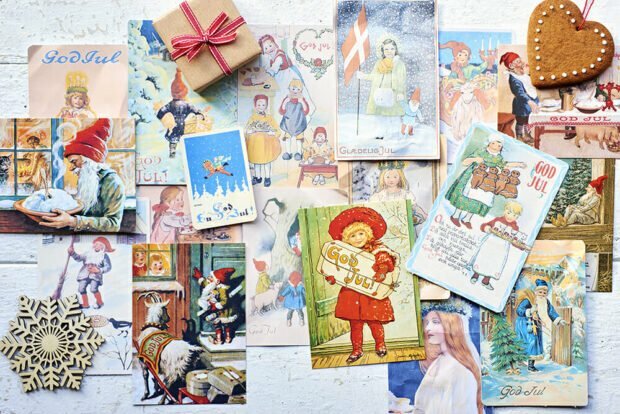 During December, people across Scandinavia will attend many different julbords. There is the work julbord, the friends’ julbord, the julbord for the golf club, the book club … The most intimate one is always on Christmas Eve with the family (less drinking at that one). Then there is the smörgåsbord at Easter, Midsummer and birthdays. 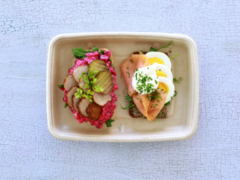 The dishes on a Scandinavian smörgåsbord vary seasonally and regionally, but the main dishes are the same – and these are also what connects us Scandis together, despite living in a place 3 ½ time the size of Britain and with quite a varied food culture. This is where you will always find herring and meatballs! 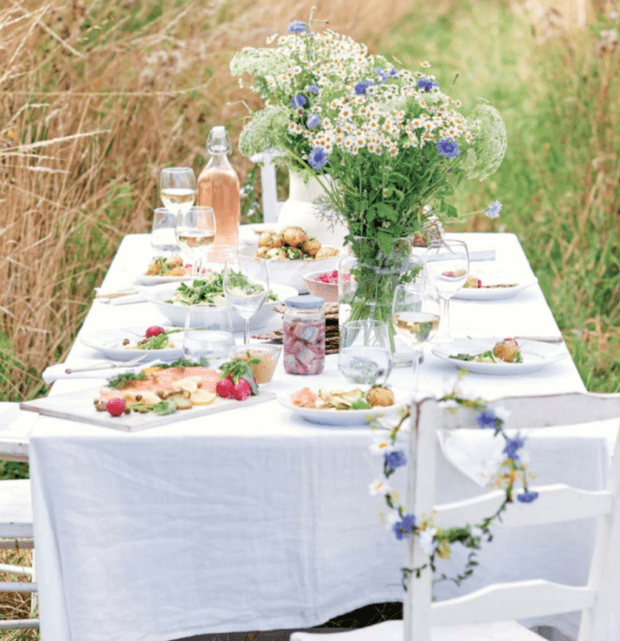 Photo: ScandiKitchen Summer Cookbook – by Bronte Aurell, photo by Pete Cassidy – click on photo for link to buy a signed copy. Always eat everything with a knife and fork – NEVER with your hands. Always start with the herring. It needs its own plate, because it’s a strong fish and you don’t want it to flavor all the other foods. We eat the herring first – and it needs a glass or two of Aquavit to go with it – it pairs well in flavor. Yes, you have to drink the whole shot and smile through gritted teeth. From this follows other fish, sliced meats, warm meats, salads and other warm dishes, then cheese and then – finally – dessert. And coffee. Everything is served buffet style or passed around the table in small servings. You will never find pre-made open sandwiches on a smörgåsbord – you are supposed to make your own as you go along – and you will also rarely find many ‘fillers’, such as warm potatoes or gravy (it is not a dinner, it is a cold table with a few contradictory warm dishes included). A good old smörgåsbord may sound a little complicated at first, but it is a very enjoyable way to spend 4-6 hours with some really nice people you get along with. While Scandinavians will never, ever talk to you at the bus stop or in the supermarket, once you have shared a few merry tunes around the smorgasbord and a few shots of aquavit, you’ll be making new friends in no time, perhaps even find yourself fluent in a Scandinavian language by song number three. Pickled herring (a few different kinds, served in bowls) and shots of cold aquavit. Singing at this point is optional. Beer is the traditional drink served with smorgasbord. You can drink wine, but if you mix that with wine, it just gets you even more drunk. Suggestion: A good plain onion herring and then Mustard herring for Swedish, Curried herring for Danish, spiced herring or tomato herring for Norway. Fish and seafood dishes. Smoked or cured salmon (with dill & Mustard sauce). Serve bowls of good quality prawns, smoked mackerel (either fresh or literally from a tin), skagenröra, halves of hardboiled eggs or any fish other than herring – even small, warm fried plaice fillets (quite a Danish thing – goes well with remoulade dressing). Lumpfish roe and creamed cod roe on the side. Cold meats and pâté. Smoked ham, salami, liver pâté (a firm favourite amongst all three countries), cold roast beef, rolled rullepolse sausage – any deli meats are served in this round, along with pickles and/or toppings. Warm meats. Meatballs (Danish, Swedish, Norwegian), roast pork (Christmas only for the Danes), mini sausages – anything warm is served for this course. If you want to serve Janssons frestelse (Jansson’s Temptation – a traditional Swedish gratin-style casserole made with potatoes, onions, cream and sweet pickled sprats) for the smörgåsbord, this is the course to do it. It’s mainly served at Christmas, but can also be served at Easter with some lamb (The sprats go well with lamb). In the summer seasons, serve a light quiche instead of heavier meats – Vasterbotten cheese quiche, mushroom pie or similar. But always meatballs. Any warm sides, such as red cabbage, can be served here – but again, warm cabbage is usually more of a winter thing. Opts for a coleslaw style in the summer. Cheese selection. Optional decorative grapes that nobody will eat and maybe a slice of green pepper that you can put in the bin after. 2-3 cheeses is enough. Go for a good blue cheese such as Kornblost or Danish blue, a solid harder cheese – Vasterbotten is always a hit here. And a milder one such as Creamy Havarti (Åseda). For the love of Thor and Freya, get yourself a good few cheese slicers. Dessert and coffee. Any soft cake, such as a strawberry Midsummer cake or a berry cake, works here and a nice selection of little fika treats goes well too – there won’t be many hungry people at the end of a smorgasbord, so limited selection is fine. 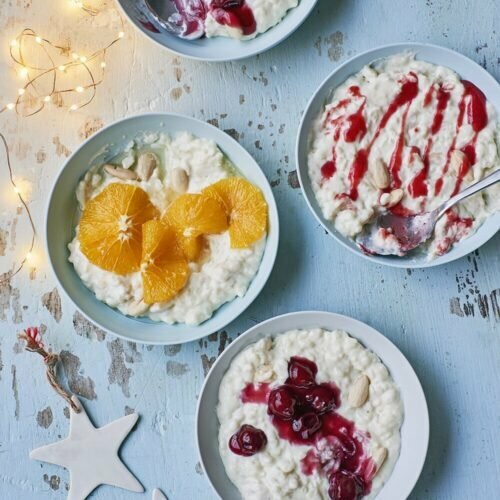 At Christmas, you might have your creamed rice pudding, in the summer a more fruity option. Or simply little marzipan/chocolate treats with the coffee. By this time, there will be no more singing, just attempt to manoeuvre a fork. 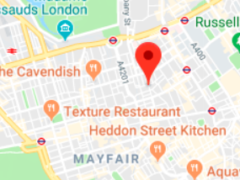 Rye bread, crusty bread and crispbreads, bowls of salads (beetroot salad, mainly), pickles, condiments, sauces such as dill and mustard sauce, Mayo, Danish remoulade – and more. Traditional drinks for smörgåsbord: Beer and aquavit. In Denmark, the last dish serves is called Skrub-Af Mad, this means “Bugger off, food” – it is served right at the end a few hours after the last bit of the smorgasbord – it is a signal for people to leave. This might be a light soup, a hotdog or similar. At Christmas, rice pudding (we actually call it ‘rice porridge’) is a big deal all over Scandinavia. We eat warm, unsweetened rice pudding with cinnamon, sugar and a knob of butter the night before Christmas, usually, and on Christmas Eve we serve the pudding cold with a few delicious additions. Scandinavians always make rice pudding on the hob/stovetop, never in the oven, and we don’t sweeten it because the toppings are sweet. This recipe makes enough for rice pudding for 23rd December - as well as dessert on Christmas Eve. If you only want to serve one of the two dishes, reduce the recipe by half. In a heavy-based saucepan, add the rice and 600 ml/21/2 cups water and bring to the boil for a good few minutes, then add all the milk and the vanilla pod/bean. Bring to the boil for around 5 minutes, stirring constantly to avoid the rice sticking to the bottom of the saucepan. Turn the heat down to low, cover and simmer, stirring occasionally, until the rice is cooked through but not overcooked (around 25–35 minutes – do check). It’s important to keep a close eye on the pan as it can burn or boil over. Once cooked, add a little salt to taste (never add the salt until the rice has cooked through). You can add a little sugar if you prefer a sweeter pudding or a few drops of vanilla extract. The pudding may still be a little liquid when the rice is cooked. Don’t worry as the milk will soak into the rice as it cools if using with the dessert. If you are keeping half of the rice pudding for the dessert and eating the other half immediately, reserve half in the fridge for the dessert and simply boil the rest with no lid for a little while longer until the rice pudding is thicker. Remove the vanilla pod/ bean once cooked and discard. Serve the hot rice pudding in bowls topped with a knob of butter in the middle and a generous amount of cinnamon sugar sprinkled over (mix one part ground cinnamon with three parts granulated or caster/ superfine sugar). Tip: If you are trying to reduce the fat in your food, you can use skimmed milk instead. The result is less creamy, but still delicious. Every year on 13th December, the Nordic people celebrate the day of St Lucia, the festival of light. On this day, originally the longest night of the year according to the Pagans, we rise early to bring in the light and break the spell of the darkness. Processions of people singing walk, wearing long white robes tied with red sashes, through towns, holding candles and singing in the light. At the front, a Lucia bride – traditionally usually a girl but nowadays it can be both boys and girls – lead the way wearing a crown with real candles. In Sweden and Norway, saffron flavoured wheat buns are often eaten on this day (in some places in Denmark, too). 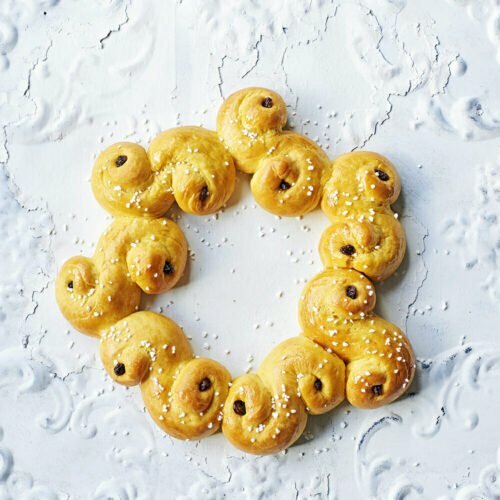 These buns have many names, the mopst common being Lussebullar (Lucia buns) or saffransbullar (saffron buns) or Lussekatter (Lucia cats – referring to the curled up shape of the buns, like a sleeping cat). 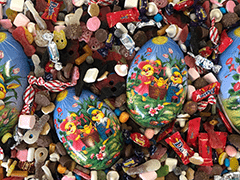 We also enjoy these buns at our famous Glögg parties throughout the days of Advent. If you like saffron, you will really enjoy these – they are delicious alongside a hot cup of mulled wine. If using fresh yeast, add the yeast and milk to a mixer with a dough hook attached. Mix until the yeast has dissolved, then add the saffron powder. If using active dried yeast pour milk into a bowl, sprinkle in the yeast and whisk together with a spoonful of the sugar. Cover with clingfilm and leave in a warm place for about 15 minutes to activate and become frothy and bubbly. Add the saffron powder. Pour into a stand mixer with a dough hook attached. Add the sugar and mix together for a minute or so, then add skyr, quark or Greek yogurt, salt and egg, and mix well. Gradually add the softened butter in pieces and begin to add the flour gradually while mixing, making sure to incorporate the lumps of butter. You’ll need around 800 g or so of flour, but the exact amount depends on how the dough feels. Keep mixing until you have a dough that is still sticky, but doesn’t stick to your finger too much when you poke it. Too much flour makes the buns dry – and saffron is extremely drying, so do watch it. If you’re using an electric mixer, knead for about 5 minutes or knead by hand for 10 minutes. Leave the dough to rise in a warm place until it has doubled in size (about 30–40 minutes in a bowl covered with clingfilm). Turn the dough out on a lightly floured surface and knead until smooth. Cut the dough into 30 equal-sized pieces. Roll each piece in your hand into a long cylinder strip, then transfer to the baking sheets and mould into an ‘S’ shape (see picture). Add a single raisin to the centre of the point where the ‘S’ shape curves (two raisins for each bun). Leave to rise again for 25 minutes. Brush gently with egg and bake them in the preheated oven for 10–12 minutes. The buns should have a slight tinge of brown on top but not be dark. Leave to cool under a damp tea towel (this prevents them from becoming dry). If you don’t eat them all in one go, freeze immediately as they go stale quickly. This recipe is taken from Bronte Aurell’s new book ScandiKitchen Christmas (RPS, £16.99). Photo by Peter Cassidy.